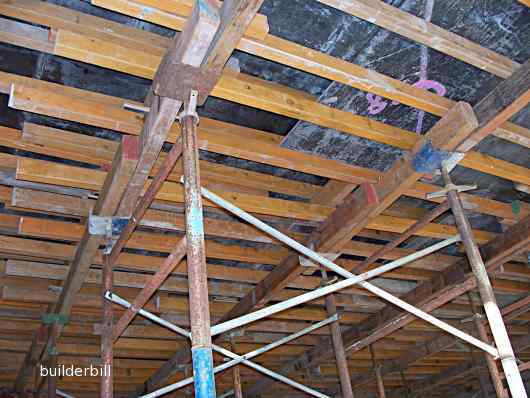 Horizontal heavier sections of steel or timber supported on props or shores, used to support the joists in suspended slab construction. Horizontal members sat on top of the bearers in suspended slab formwork. In the photo above the bearers are the timbers sat immediately on top of the steel frames. They spacing of the bearers in both cases here is about 1200 (4ft) which is the with of the steel shores that they are sitting on. The joists in turn are sat on top of the bearers. The joists are nominally spaced at 400 (16") centers, but quite often it appears that they are spaced a lot less than that because of overlaps. Here is another set using different material. A critical factor in formwork materials is how many times they can be reused before throwing them away. So timbers like these are never cut shorter when they can be kept longer by overlapping or leaving then overhanging. 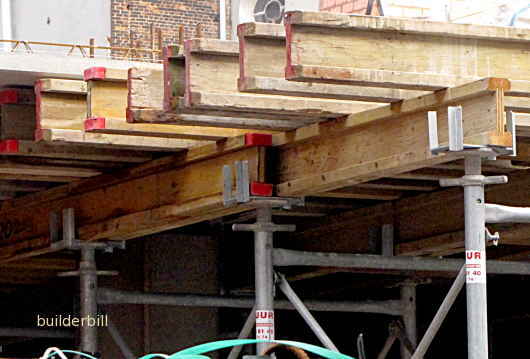 A growing trend in this kind of formwork is the use of timber engineered products like the ones illustrated here. Above is a shutter using 100 x 75 (4"x3") laminated in about 3mm layers. These products have the advantages of being consistent, straight and available in long lengths. Being made out of plantation grown softwoods they are ecologically sound.